This Hotel requires a prior confirmation. We normally respond within one hour but in some cases it may take up to 48 hours. DINASTY is a hotel that most of all recognizes the importance of its guests’ well being during their stay. The basic principle is “Successful business through happy repeat guests”! Besides the warm characteristic Albanian hospitality, the guests may enjoy accommodation in spacious rooms where exceptional experience is assured through large high quality beds (full / king size), working desk, free wireless and wired broadband internet connection, bathtubs or spacious showers, toiletries, hairdryers etc. At DINASTY Hotel is offered 24h reception services, wide parking area even for large buses, free wireless broadband internet connection, discounted airport pick-up/drop-in service etc. The hotel has taken a long time to build and is now a real art gallery with its hand-carved wood and stone, crafts iron work and traditional stained glass and mosaics. 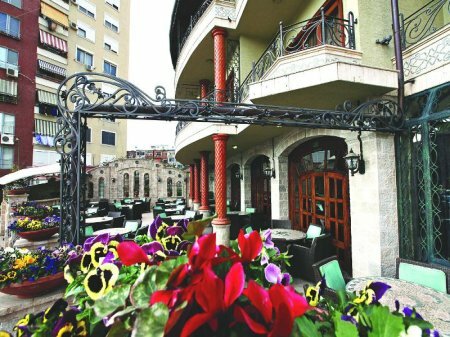 Although quite new in Tirana, the hotel has already gained an exceptional reputation among customers and guests for its well designed facilities as well as for its professional service and extraordinary hospitality of the whole staff. Reservations cancelled at least 48 hours, prior to the arrival date, will be fully refunded. Cancellations less than 48 hours, prior to the arrival date, will be charged for the first night.